Milk, it does the body good. 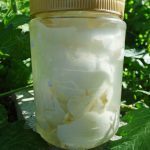 But did you know it may also be good for the garden? Using milk as fertilizer has been an old-time remedy in the garden for many generations. In addition to helping with plant growth, feeding plants with milk can also alleviate many issues in the garden, from calcium deficiencies to viruses and powdery mildew. Let’s find out how to take advantage of the beneficial fertilizer components in milk. Milk is a good source of calcium, not only for humans, but for plants as well. Raw, or unpasteurized, cow’s milk has some of the same nourishing properties for plants that it has for animals and people. It contains beneficial proteins, vitamin B and sugars that are good for plants, improving their overall health and crop yields. The microbes that feed on the fertilizer components of milk are also beneficial to the soil. Like us, plants use calcium for growth. A lack of calcium is indicated when plants look stunted and don’t grow to their full potential. Blossom end rot, which is commonly seen in squash, tomatoes and peppers, is caused by a calcium deficiency. Feeding plants with milk ensures they will get enough moisture and calcium. Feeding plants with milk has been used with varying effectiveness in pesticide applications, especially with aphids. Perhaps the best use of milk has been in reducing the transmission of mosaic leaf viruses such as tobacco mosaic. Milk has been used as an effective antifungal agent, specifically in the prevention of powdery mildew. Using too much milk isn’t a good idea since the bacteria in it will spoil, resulting in a foul odor and wilty, poor growth. The fat in milk can produce unpleasant odors as it breaks down as well. The benign fungal organisms that colonize leaves and break down milk can be aesthetically unattractive. Dried skim milk has been reported to induce black rot, soft rot, and Alternaria leaf spot on treated cruciferous crops. Even with these few drawbacks, it’s plain to see that the benefits far outweigh any downsides. So what type of milk can be used as milk fertilizer in the garden? I like to use milk that is past its date (great way to recycle), but you can use fresh milk, evaporated milk, or even powdered milk as well. It is important that you dilute the milk with water. Mix a solution of 50 percent milk and 50 percent water. When using milk fertilizer as a foliar spray, add the solution to a spray bottle and apply to plant leaves. The leaves will absorb the milk solution. 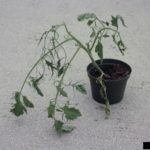 However, keep in mind that some plants, like tomatoes, are prone to developing fungal diseases if the fertilizer remains on the leaves too long. If the solution is not being absorbed adequately, you can gently wipe down the leaves with a wet cloth or spray them with water. Less milk can be used if you have a lot of plants to feed, as with a large garden area. Using a garden hose sprayer is a common method for feeding plants with milk in large gardens, as the flowing water keeps it diluted. Continue spraying until the entire area is coated. Distribute about 5 gallons of milk per acre, or about 1 quart of milk per 20-by-20-foot patch of garden. Allow the milk to soak into the ground. Repeat every few months, or spray once at the beginning of the growing season and again during mid-season. Alternatively, you can pour the milk mixture around the base of the plants where the roots will gradually absorb the milk. This works well in smaller gardens. I normally place the top portion of a 2-liter bottle (upside down) in the soil next to new plants at the beginning of the season. This makes an excellent reservoir for both watering and feeding plants with milk. Do not treat the area with any form of chemical pesticide or fertilizer after applying milk fertilizer. This can affect the main fertilizer components in milk that actually help the plants—bacteria. While there may be some odor from the decaying bacteria, the aroma should subside after a few days.